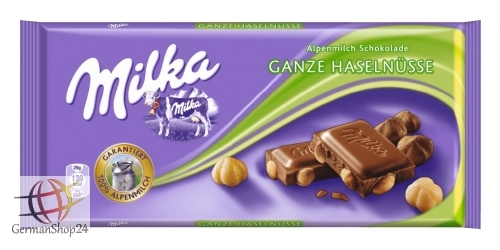 Milka Whole Hazelnut is the ultimate chocolate experience for all nut lovers. 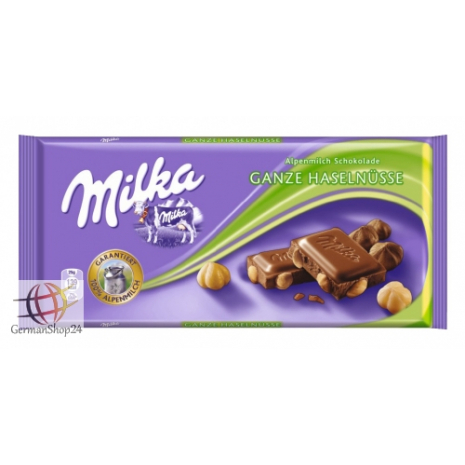 Signature Alpine milk chocolate encases aromatic and crunchy whole roasted hazelnuts. Indescribably delicious with just the right amount of crunch. Sugar, HAZELNUTS (20%), cocoa butter, SKIMMED MILK POWDER, cocoa mass, SWEET WHEY POWDER (from MILK), BUTTERFAT, emulsifier (SOY LECITHIN), HAZELNUT PASTE, flavoring. Zucker, HASELNÜSSE (20%), Kakaobutter, MAGERMILCHPULVER, Kakaomasse, SÜSSMOLKENPULVER (aus MILCH), BUTTERREINFETT, Emulgator (SOJALECITHIN), HASELNUSSMASSE, Aroma.